No one group is more tuned in to climate change than farmers. Whether you believe it is a direct result of carbon dioxide emissions, or just natural forces at work, it is impossible to deny that climate change is upon us. When I talked with Steve Wood at Poverty Lane Orchards in Lebanon, New Hampshire, a couple of years ago, he observed that the number of hail events that wiped out apple crops in New Hampshire in the past five years had exceeded all in New Hampshire for the previous twenty-five years that he had grown apples. Without question, our summer storms in the past five years have become increasingly violent with microbursts, downdrafts and tornadoes accompanied by some mighty impressive lightning. Three years ago Peter Van Berkum’s native-plant greenhouse and nursery in Deerfield, New Hampshire, was hit by a tornado that gave a newly-heightened meaning to the verb “trashed.” Again, this year’s weather patterns have put the hurt on farms throughout New Hampshire and Vermont (check out the photos of the Skovsted’s carnage at http://www.joesbrookfarm.com). We here thus far have been spared a hit from some of these storm cells that in this modern age we can now watch developing and track on our computers. Not only do we check the computer to look for what might happen to us, but we have the unpleasant advantage now of knowing which of our farming neighbors is getting whacked. On the flip side, the computer allows us farmers the ability to stay connected to one another in the greater agricultural community at a time of year when it seems hard to find the time to get to the store to get toilet paper and dishwashing soap. Farmers now have listserves as well, and this past week some of the more fortunate farmers who had extra field transplants were able to coordinate getting plants to our less fortunate friends who got clobbered. The important point to recognize is this; we as farmers are not in control. People call up asking when the berries will be ready. 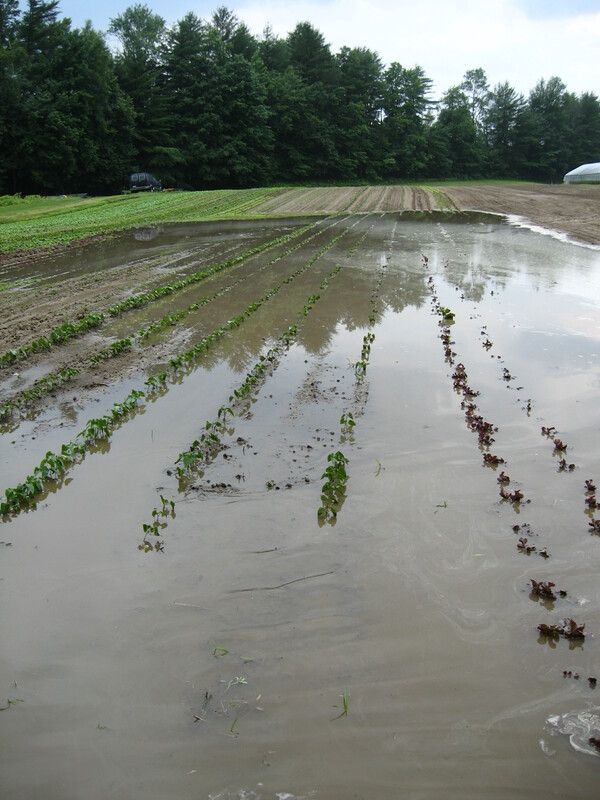 They wonder why this farm has good squash and another doesn’t. It’s all about the weather. I can only make sure that I plant the seed, provide fertility, keep ’em somewhat pest-free. Beyond that is luck and forces that are out of our control.